Scarrington Church was originally a chapel of ease to Orston until 1867. 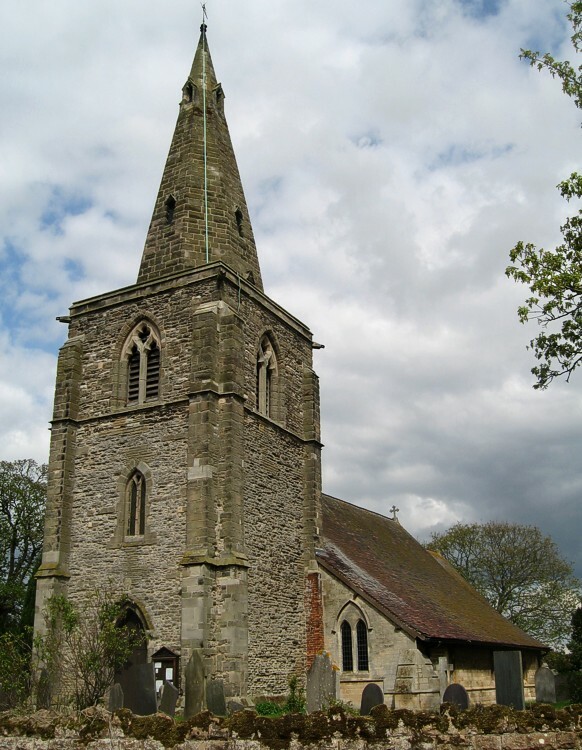 Built of stone, the building comprises a chancel, a nave of three bays, south aisle, vestry and west tower with octagonal spire, formerly containing three medieval bells, one bearing the arms of John Kempe, Archbishop of York 1426-52. These were silent for much of the 20th century but restored in 2002, when a fourth bell was added. Tower and spire are of the 14th century, the tower rising in three stages. The priest’s door and two lancet windows in the chancel incorporate 13th century work, as do two buttresses on the north of the nave. Originally there was a north door, now walled up. The south arcade is 14th century consisting of three wide arches supported by an octagonal column and a circular column. Round the base of each are circular stone benches for the infirm. Entrance is by a west doorway in the tower. It has a two-light, early Decorated window above it. Elsewhere in the building there are good examples of Decorated square-headed windows. The small font is from 1662. Outside there is a small scratch dial. The church was in a ruinous state in 1802 when it was repaired, the south aisle removed and the south arcade walled up with bricks. In 1867 the aisle was replaced, the church enlarged, new windows inserted, the ceiling removed, roofs retiled and old pews replaced. The tower and spire were repaired in 1896 and the tower again in 1960. The chancel arch and reredos are from the 19th century. In 1960 a glazed oak-framed screen was erected across the upper east arch of the tower.